Wow, I love this app. It gives you a great big bright clock (digital or analog) while your phone charges at night (I put it in a dock, so it's standing up and easier to read). Many apps do this, but the problem is they throw too damned much light. Bedside Clock remains absolutely black...unless you touch the phone, or wave your hand near it, or tap the nighttable, at which point it illuminates (at a custom brightness level, so you don't need to shock your eyes). No alarm built in; just set alarms via Apple's clock app, which pops up notifications anyway. Note that this is a bit fidgety to set up (spend time getting it right). Massive life improvement! Lousy....but the best way to create and edit blog entries on the go. Lousy....but the best podcast app if you prefer streaming (which you'd be crazy not to). Lousy....but the best movie app if you want easy flexibility switching from viewing nearby theaters to viewing nearby movie titles. Also: watch-lists. Lousy...but the best way to save longer web articles for later reading. I also email reading material to my Instapaper account. Often fails to grab all the photos, damn it. Also, it leaves off comments. And they keep adding on stupid features, rather than shore up the basic functionality. Yet still invaluable, and keeps me from having to keep a jillion browser tabs open. I keep my restaurant list here. On my Mac, it's an RTF document, and I use a macro to export it (via Calibre) into an .epub, divided up by chapters (nabes), which I periodically synch to Marvin on my mobile devices. The great thing about Marvin is I can search for a text string - say, 'pancake' - and be shown every instance, in context, organized by nabe. 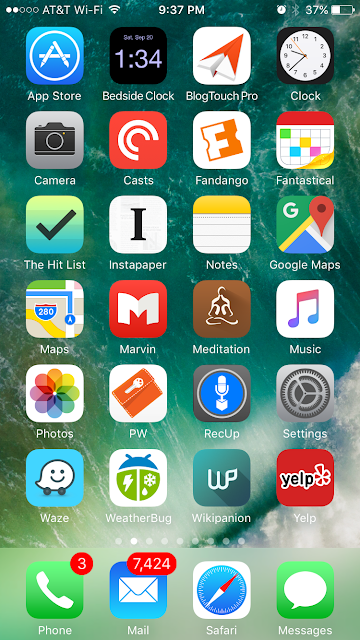 Yelp's bookmarking is handier, but their iOs apps choke with too many bookmarks, so I'll keep maintaining my 30 year old document with its untold thousands of venues. I also keep my Tip-of-Tongue list in Marvin. Super-flexible meditation timer. Handy if you have multiple steps you need timed at different durations. I use the "Tingshas" alert sound (with "repeat" toggled off); it's the only one I've found that's both audible and non-annoying. Brilliant. Hit the big red button, it records. Hit the button again to stop, and it auto-saves the sound file to DropBox. Done. I use IFTTT to notify me via email of new sound clips awaiting, so I remember to transcribe when I'm back home....using this Transcription app on my Mac (which I've set up with lots of custom keyboard shortcuts to help me pause, fast forward, etc. without reaching for the mouse). It's dumb and annoying to have dedicated apps for web sites that work perfectly well in-browser (Amazon, I'm looking at you). But you unquestionably want Wikipanion for Wikipedia. SO much better. And it's free! I use it many times per day. Lets me wish-list apps (both for iOs and OS X), which cuts down on compulsive purchases. Also lets me see price history, so I can predict if a sale might be forthcoming (plus: emailed alerts when a wish-listed app goes on sale). App isn't well-maintained, but the web site's still there, and just as good. Craft beer offerings for venues near you (great for bar discovery; they're opening so fast no one can keep up), and also a search engine to locate places serving individual brews. I can't figure out the logging features, but that's ok. Ever wish you could hold up your phone and flash a message? It doesn't work with the shrimpy font in a text editor app. This shows....yup....big words. I use it to order in noisy bars, or to flash sardonic messages to friends seated at a distance from me. "Real-time departures. Transit maps. Line status and real-time disruption alerts. Uber integration. Bike routing and live bike share info. Everything you need -- and may not even realize you need -- to manage your life in the city." I only use this while traveling, but they say it's awesome for NYC too. Much beloved around the world, though I haven't dived in deeply yet. Apparently, it doesn't use data, but I always get a local data plan while traveling anyway. My own app. I probably know more about ordering in "ethnic" restaurants than you do. And yet even I find this indispensable, and refer to it often, because I can't possibly keep all the info in my head. It's insane how rich and useful this app is. It's the most useful and ambitious thing I've ever created, and it's addictive even for armchair perusal. Few people have their own web server anymore, in spite of the extreme cheapness. Most use DropBox or iCloud instead. Well, I'm old school, and that means you also gotta have an FTP client. PIA to set up, alas. When traveling, I mostly use ultra-cheap AirBnbs. But sometimes I go blind, and book very last minute (i.e. when I get to town) via the HotelTonight app. It offers nice, luxe hotels at steep discount. I enjoy the cheap splurge and the carefree spontaneity. 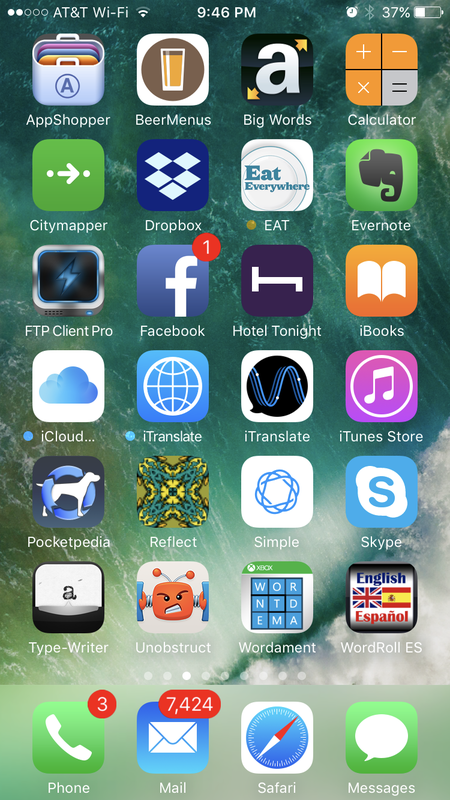 A family of apps for written or spoken translation. Kind of magical to be able to dictate in English and have it chatter forth in other languages. And it really works! I catalog all my books, CDs, and DVDs in Bookpedia, CDpedia, and DVDpedia, respectively. These are Mac programs from a great company called Bruji. Pocketpedia is a small iOs app for accessing all that data on the run. Nothing fancy, but very convenient. The most obscure app I own. Hasn't been available in many, many years, and iOs 11 breaks it - which is why I'm still in iOs 10. Here's a demo, and here's info on the ambitious plan that unfortunately was soon abandoned. Online banking. Good for what it is, which is very limited, but they offer some fee-free ATMs. I don't use a physical bank, so this is necessary. I detest any form of video chat. But at some point you're going to need to make a phone call without a cell connection (or, at least, without a good one), and if you have a balance on Skype, that's your lifesaver. Facetime audio is even better, but doesn't work for landlines or Android people. Ok, maybe I have the sensibility of a 15 year old girl, but I totally love this retro typewriter which allows you to waft your anonymized output into the void (i.e. to be read by other users), and to read their stuff, as well. All inner thoughts, no ditzy chatter. As Chowhound demonstrated, if you can cultivate a great crowd, infectious quality ensues. Something about clacky, cranky old typewriters attracts insightful, clever writers and dreamers. Way beneath-radar, and I love it. Unobstruct: This isn't actually on my second screen, I just stuck it there to remind me to tell you about it. It's a service app that installs itself into Safari. If you choose it from the "share" menu, it will remove those floating header or footer bars that get in your way and limit the area of visible text. Must-have. More info here. I've been very addicted to this game for years. I'm "Ouchmyfinger". Decent cheap fast Spanish dictionary. I use the iTranslate apps (see above) for more complicated needs. Woops, this is no longer available.